In a spirit of engagement with the individual and the world, artists exhibiting in ‘do it’ have conceived open-ended instructions that open up new possibilities. Ceding control of the finished object or performance, each artist imagines an action that is limitless in interpretation or time allowing everyone to make an artwork. Originally conceived by Hans Ulrich Obrist, Christian Boltanski and Bertrand Lavier in 1993, the exhibition collates all the historic works together, embracing many diverse practices by living and deceased artists. 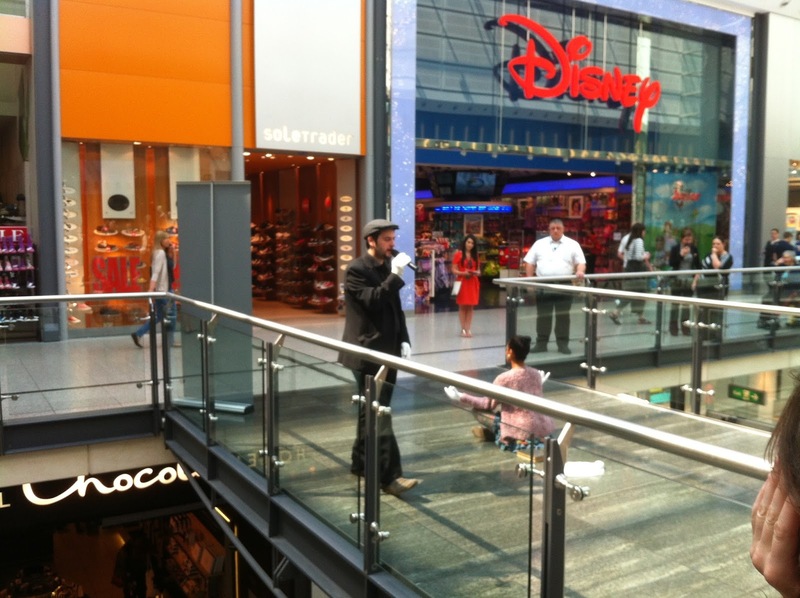 As an extension of the show beyond the gallery, Theaster Gates has staged a performance within the city’s shopping centre titled ‘How to catch the Holy Ghost or Get Arrested in a Shopping Mall’ using the repetition of a phrase randomly selected from the bible. I saw ‘my soul refresh’ spoken outside big- brand shops until the performer grew hoarse proposing an alternative condition to consumption. Some pieces simply provide succinct one-word invocations such as Lutz Bacher’s ‘LIVE’ or Uri Aran’s ‘Doodle’ while others might involve a negation or a position of resistance such as Carl Andre’s ‘It is best to do nothing’ written on a postcard as a cryptic form of advice. The success of the exhibition’s concept lies in its endless variation and possibilities for interpretation. Some works are precise while others dispense with detail to encourage multiplicity. Individual artists address progressive instincts for reforming the world while others embark on absurdity, a DADA strategy of subversion and satire. For example, Andreas Slominski asks for a lemon to be squeezed against a bicycle seat. Tacita Dean summons the sublime with a direction to find and press a four-leaf clover. 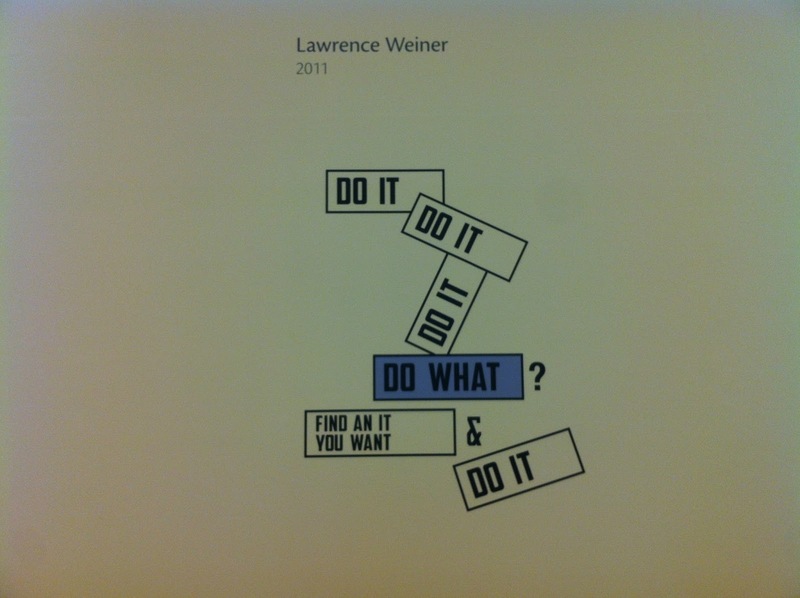 ‘do it’ asks us to consider new opportunities and the potential of imagination. These works often require courage to attempt the impossible, the fantastical and the ridiculous. Improvisation becomes a value for art and living in its own right. Some instructions lose authority when there’s little at stake for the artist or the facilitator. Sometimes ideas seem glibly tossed out on the spur of the moment to meet the project’s criteria. But ‘do it’ admirably attempts to find a free terrain between inspiration and enactment. It is also potentially limitless in size and ambition. The audience encounters a flurry of competing ideas encompassing practical and creative challenges. While it may be overly loose in some parts, the exhibition also contains rigorously disciplined work. ‘do it’ builds on its conceptual power and leads artists and audiences towards a dynamic collaboration. Previous PostThe Vessel by Mike Ricketts at Works|Projects, Spike Island, BristolNext PostJose Dávila’s ‘Shadow As Rumour’ at the Max Wigram Gallery, London. Thank you for the appreciation. It's good to receive comments as the site is designed to be a catalyst for discussion and as a resource for thinking about art and artists. Thats great work you have shared here thanks.